The Beatles’ movie Magical Mystery Tour, originally broadcast on the BBC in 1967, opens with the line, “When a man buys a ticket for a Magical Mystery Tour he knows what to expect. We guarantee him the trip of a lifetime.” Perhaps the Beatles presumed that those who were “turned on” would understand what was going on, but the film was a poorly conceived and hard to follow. More than anything, this film showed that the Beatles were struggling to find their direction in their first major project after the death of their manager, Brian Epstein. 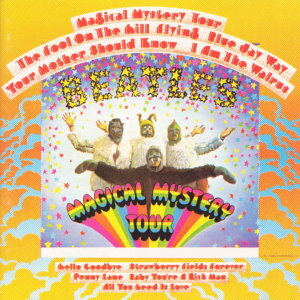 Still, the record that accompanied the film, also called Magical Mystery Tour (1967), had plenty of good music to keep fans happy. With all of the nonsense and surreal imagery it was understandable that fans would be looking for clues about Paul McCartney’s rumored death and replacement by a lookalike on this album, particularly when the title song announced, “the magical mystery tour is dying to take you away”. Posted on October 10, 2013 March 12, 2015 by Dead Man	in Paul Is Dead. Tags: Beatles, Magical Mystery Tour, Paul is dead.